Wondering where to stay in Jaipur? The city has a great range of accommodations for all budgets, from plush palaces to lively backpacker hostels. Many of them are heritage hotels. In terms of location, the peaceful residential neighborhoods of Bani Park and Hathroi Fort are ideally situated central to Jaipur's railway station and Old City. The Rambagh Palace was once the home of the Maharaja of Jaipur, and you'll definitely feel like royalty when staying there. This magnificent palace was built in 1835 and converted to an exclusive luxury hotel in 1957. It sits on 47 acres of meticulously landscaped gardens to the south of Jaipur's city center, about 15-20 minutes from most attractions. As you'd expect, the hotel is suitably opulent. Its 45 spacious guest rooms and 33 suites (one of which was the Maharaja of Jaipur's bedroom) are set around a courtyard, and decorated with antiques. Its sumptuous Suvarna Mahal restaurant was once the royal dining room. Another highlight is the Steam bar, which occupies an old restored steam train on the hotel grounds. The property also has a croquet lawn, golf putting green, spa complex, two swimming pools, fitness center, and yoga pavilion. Wireless Internet is complimentary. Rates start from around 28,500 rupees per night. The Oberoi Rajvilas also provides guests with a regal experience. 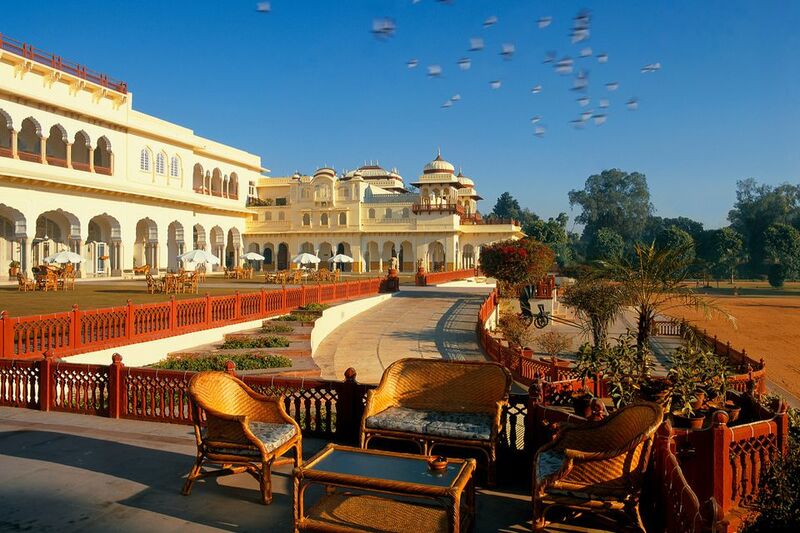 However, unlike the Rambagh Palace, this five-star hotel was architecturally designed to resemble a Rajasthani fort palace complete with pink walls. It was built in 1997, around an 18th century Shiva temple on 32 acres of land, and was the first of the Oberoi group's "vilas" properties (which are all newly constructed heritage replicas). Guests can choose to stay in either a room or suite (with its own private pool), or air-conditioned luxury tent (which is so lavish, it definitely doesn't feel like a tent). The Rajvilas is ideal for those who don't mind being outside the city center, as the hotel is about 30 minutes away on the eastern fringe of Jaipur. It's priced similarly to the Rambagh Palace (although wireless Internet is only free for the first half hour). Expect to pay 30,000 rupees upwards per night. The impeccable 2014 renovation of the Rajmahal Palace was far from predictable. It crafted a vibrant and modern hotel, quite unlike any other heritage property in the city. More than 40 bespoke wallpapers have been used a flamboyant fusion of classical and contemporary styles. The palace was built in 1729 as a pleasure garden for the queen and it's still owned by the Maharaja of Jaipur. There are just 14 rooms and suites, many of which are named after famous guests, providing an incredibly intimate experience that feels like staying in a royal home. The hotel also has three restaurants and a bar. Laze by the Art Deco swimming pool, get pampered at the wellness spa, watch a polo match in the royal box, or take a private tour of the City Palace. Rates start from about 40,000 rupees per night for a double including tax and breakfast. If you're looking for a palatial boutique stay near the walls of Jaipur's Old City, you'll love gorgeous Samode Haveli. This 225 year old property, with only 39 guest rooms, is the best heritage hotel in town. It was built as the city home of the aristocratic rulers of Samode and is still occupied by their descendants, who have invested hugely in its renovation and upgrade. The hotel's rooms are all distinctly different and spread out over the property, as they were formerly royal apartments. It's possible to stay in the royal bedroom -- the exquisite fairy tale Sheesh Mahal (mirrored palace) suite, accessed through a series of courtyards and corridors. What's particularly noteworthy is that the hotel doesn't accept large groups, making it a serene sanctuary in the heart of the action. It's perfect for romance, as it's beautifully illuminated by oil lamps at night. The area around the Moorish-style swimming pool is particularly stunning. Rates start from around 12,000 rupees per night. Another atmospheric boutique heritage property, Dera Mandawa was constructed in 1885 by the ruler of Mandawa (in Rajasthan's Shekhawati region), as a place to stay when he was visiting Jaipur and attending the royal court. Today, it's run as a hotel by his great grandson and family. However, it's more like a homestay as guests are able to interact and dine with the family. They've done an outstanding job of modernizing the property, while retaining its traditional charm. It's intimate, with only 11 guest suites, and is conveniently located close to the Chandpole gate entrance to the walled Pink City. A range of cultural experiences are offered including sari and turban tying, kite flying, food walks, gourmet cooking demonstrations by the lady of the house, and hanging out with camels on the family's farm. Rates start from 9,000 rupees per night. No ordinary guesthouse, 28 Kothi has been buzzing with hip clientele since it opened in early 2016. In 2017, it was the only Indian property to make it onto the Conde Nast Traveler Hot List -- not surprising really, as its a joint venture (and passion project) one of the owners of Jaipur's Gem Palace and an eminent Mumbai restaurateur. Tucked away in a lane in Jaipur's quiet Civil Lines residential neighborhood, this luxury boutique villa has five stylish tropical-feel guest rooms, an Ayurvedic-influenced spa, healthy vegetarian cafe, library, and terrace for yoga. It's a real urban oasis. Expect to pay 5,000 rupees per night upwards. Sprawling Shahpura House is also home to a ruling royal family, from Shahpura in the Shekhawati region of Rajasthan. They live on the top floor of the property and utilize the rest as a heritage hotel with 65 guest rooms. Its architecture is an elaborate fusion of Hindu Rajput and Islamic Mughal styles, and includes an elegant durbar hall (royal reception hall) with a glittering chandelier. The property also has an outdoor swimming pool, spa, four restaurants, and a lounge bar. The family has taken a commendable eco-friendly approach to conserve energy and water, and they also invite guests to join them in celebrating festivals such as Diwali and Holi. It's a special experience! Expect to pay 10,000 rupees per night upwards, although substantial discounts are given in the low season with rates dropping as low as 4,000 rupees per night. The erstwhile family of Borunda (near Jodhpur) own two similar and very popular heritage-style hotels in Jaipur's Bani Park neighborhood -- Umaid Bhawan Heritage House and the slightly cheaper but newer Umaid Mahal. Do be aware that both are convincing heritage replicas rather than authentic heritage properties. They have courtyard swimming pools, characterful rooftop restaurants, and a bar. Expect to pay around 4,000 rupees per night upwards. Family-run Hotel Pearl Palace is an award-winning budget hotel with a boutique feel. It's undoubtedly the most popular budget hotel in Jaipur, particularly with backpackers, due to its enthusiastic service (including free airport or train station pick-up) and wide variety of clean rooms. The hotel is furnished with Rajasthani handicrafts, and has a clothing boutique and shop that's a recommended place to buy inexpensive silver jewelry. Free Wireless Internet and the hotel's renowned Peacock rooftop restaurant add to its appeal, as does its location in the Hathroi Fort area. Air-conditioned standard and deluxe double rooms are available through booking engines and cost 1,600-2,000 rupees per night. Specialty accommodations, such as dorm beds and family rooms, must be reserved directly through the hotel. The hotel also has a lovely sister property, the Pearl Palace Heritage Boutique Guest House, which featured in the Second Best Exotic Marigold Hotel movie. Arya Niwas is another favorite budget hotel in Jaipur, with less of a backpacker vibe and more of a refined homely feel. It's located in a stately 150 year old heritage mansion, which once belonged to a feudal lord, not far from the Old City. The hotel was the dream of a retired engineer who, along with his sons, redesigned and converted the rundown mansion. It opened with 20 guest rooms (there are now 92) in 1983, and the whole family joined in running it. Cleanliness and safety are priorities, and special attention is given to solo women travelers. The hotel's restaurant serves healthy vegetarian food but doesn't sell alcohol. Eco-friendly practices are also followed. Expect to pay 2,600 rupees upwards for a double room including breakfast. There are cheaper rates for singles. Iconic Atithi Guest House has been providing affordable accommodations to travelers near the Old City for more than 25 years. It's has 22 rooms spread over three levels, rooftop garden restaurant that serves beer, business center, travel desk, library and reading room, and plenty of spaces for guests to relax. Rates start from 1,200 rupees per night for a double room without air-conditioning. The highlight at Hotel Anuraag Villa in Bani Park is the huge back garden, which is like a little oasis in the middle of the city. Peacocks can often be seen there. The hotel has 21 simple but attractive rooms, friendly staff, and good food (vegetarian only). Guests who love to read will appreciate the hotel's library. There's free wireless Internet too. Rates start from 1,200 rupees per night for a double without air-conditioning. A real bargain in Jaipur, Sunder Palace is a three-level home that's been converted into a guesthouse with 22 rooms in the Hathroi Fort area. The rooms are spacious, spotlessly clean and comfortable, and inexpensively priced. There's also a rooftop restaurant with views and tasty vegetarian food. To top it all off, the owners and staff are very helpful, and the hot water is plentiful. Rates start from just under 1,000 rupees per night. Vinayak Guest House offers travelers dormitory accommodations, as well as simple private rooms, in Bani Park. It's a family-run place with really kind and attentive staff, safe environment, yummy home-cooked Indian meals, rooftop restaurant, and chill out zone with free wireless Internet. Expect to pay 399 rupees per night for a dorm bed, going up to 999 rupees for a deluxe double room with air-conditioning. Madhav Guest House occupies a new white building in Bani Park, and has welcoming and honest owners. There are 10 rooms, all equipped with TVs and spotless private bathrooms with hot water. There's also a rooftop terrace restaurant that serves excellent food (although some guests say it's overpriced). The property is well-maintained and comfortable. Staff are knowledgeable and assist with making travel bookings. Rates start from about 1,000 rupees per night for a double, and it's top value for money. Don't be concerned about the low tariff! One of India's first backpacker hostel chains, Zostel is a groovy hostel with staff who make sure guests have a fun experience. It has everything a hostel needs -- air conditioned rooms, fast wireless Internet, sociable communal spaces, common kitchen, and clean rooms and bathrooms. Zostel recently moved to fantastic new centrally-located premises in the Old City, near the Hawa Mahal and City Palace. There are both female and mixed dorms, with rates starting from 399 rupees per night. Private rooms cost 1,600 rupees per night. Following on from the successful launch of the Moustache Hostel in Delhi, the owners have gone on to create a designer hostel from scratch in Jaipur. Special emphasis has been given to elements of Rajasthani culture, with decorative wall art, tiles, bright colors, and puppets! This is a very contemporary and classy hostel. What also sets it apart is its handy location on M.I. Road, close to the railway station and Old City. The hostel has 16 rooms, including private doubles, mixed dorms, and female-only dorms. Rates start from 380 rupees per night, for a bed in a non air-conditioned dorm. Private doubles are 1,700 rupees per night.